This page was first written way back in February 2008. Updated 2017. We first found this restaurant in 2005 or 2006 while doing one of our "go for a drive" days exploring back roads in Phuket. 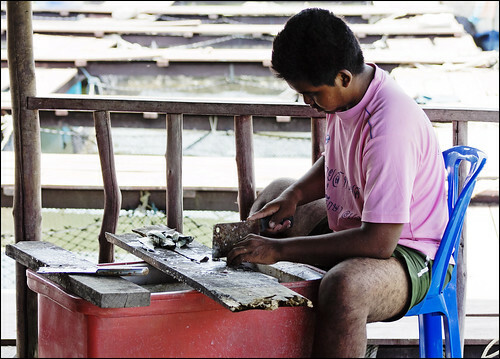 This is not the beaches and tourism side of Phuket! 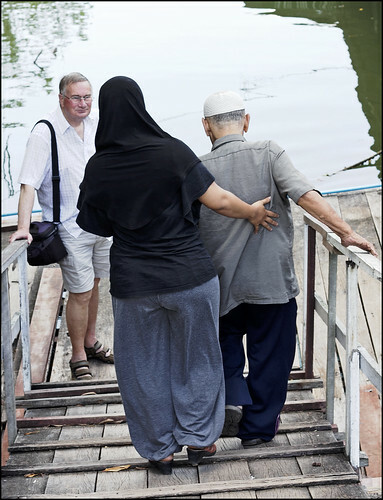 Bang Rong is a small Muslim fishing community located on the northeast coast of Phuket and, if I recall, the first time we headed down the small side road there was no sign saying "restaurant", we just wanted to see where it went. 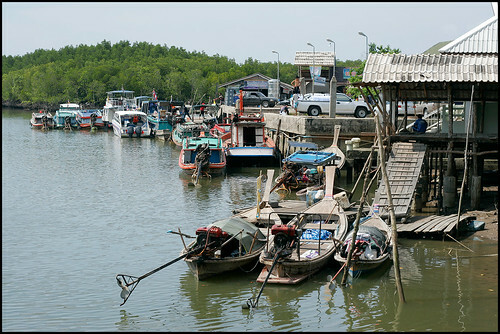 We found a busy pier with boats coming and going, heading out to islands east of Phuket like Koh Yao Noi and Koh Yao Yai, and lots of longtail boats and small fishing boats. We also found lots of monkeys in the mangroves. 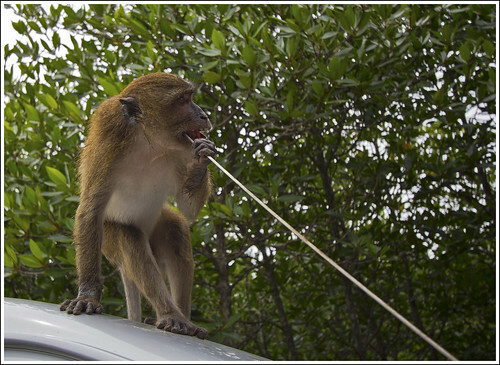 One time after eating here we came back to the car to find a monkey eating the radio aerial! 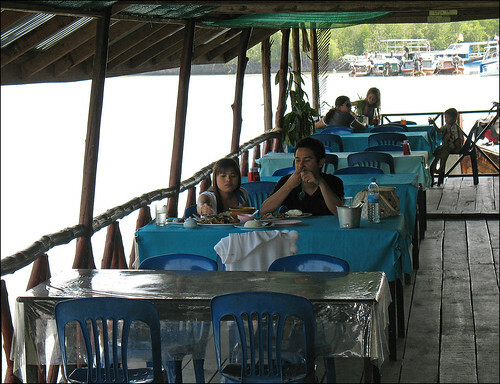 We've been here many times now, and we like the small family run floating restaurant (it's actually called Chum Chon restaurant, though we always just call it Bang Rong, after its location) reached by a wooden walkway through the mangroves. The first time we just found it by accident - just followed the walkway and found lunch! 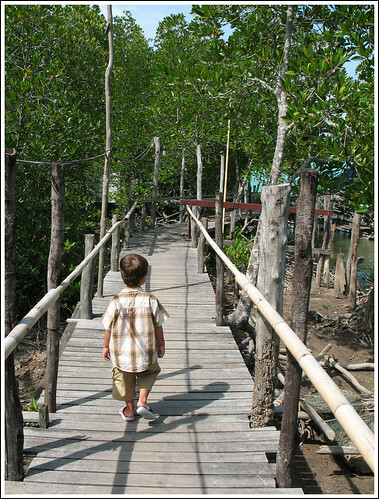 (above) The final part of the walkway changes angle depending on the tide - a steep walk down at low tide! Here's my Dad waiting for a couple of local folks to clear the gangway. I am happy to say that we'll be back here again to eat. It's remained a favourite spot for many years. It's quiet, it's relaxing and it's friendly. On our last visit, we probably had not been for well over a year, but they remembered us. 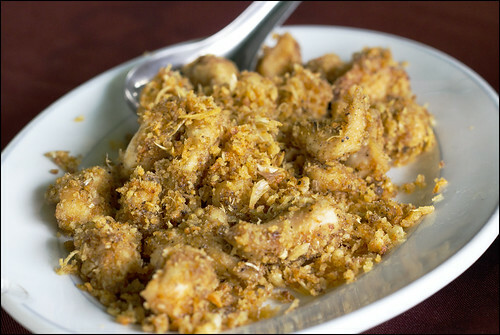 You can get seafood here, and I saw a huge plate of curried crab being carried to another table. 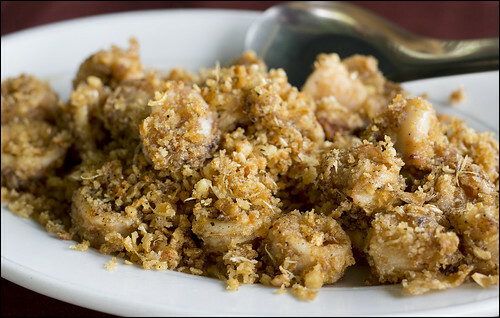 We tend to order simple dishes like fried rice with prawns, or fried chicken with garlic. They do the simple food very well. My wife says the fried rice is one of the best she's had. No joke - it's hard to make a really tasty fried rice and easy to make it bland. The chicken they did for the kids was great too. 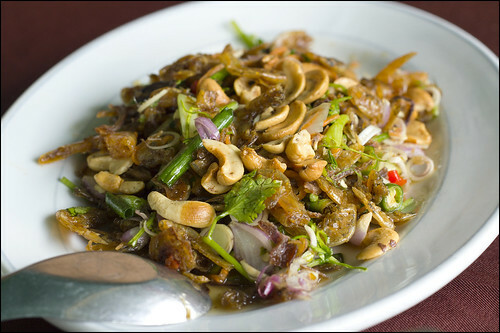 (above) Yam Gung Siap - spicy local style salad made with crispy dried shrimp - you can really only get this in the Phuket or Phang Nga area. I love it! Out back they keep the fish in nets, either for sale in the restaurant or at market. 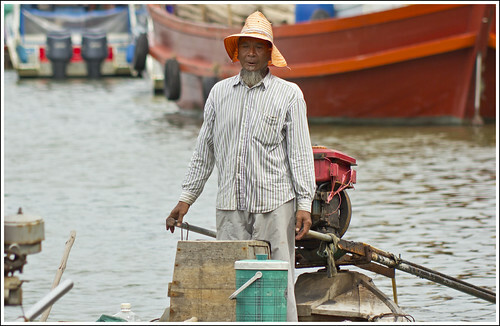 The whole Bang Rong area is full of fishing folk who are only just starting to make any money from tourism. By the way, the owners are a Muslim family and they don't sell alcohol here, so don't come looking for a quiet place for a cold Singha! I like to sit and eat slowly, camera ready to snap a photo of a local boat. Hard to believe this is Phuket Island! The most touristy place in Thailand! 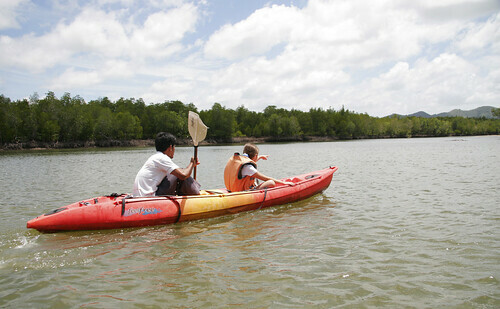 (above) There are some kayaks available for rent, which you can paddle up the river into the mangroves. 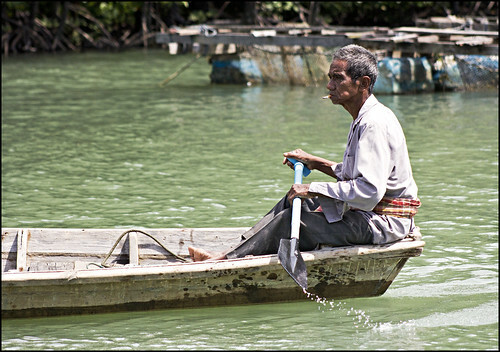 You can just rent one with or without a paddler, who will be one of the family running the restaurant. We did this a few years ago and gotta do it again one day - see Kayaking in the Mangroves.